Part 1 Methods for authentication and traceability: Advanced PCR techniques in identifying food components; DNA methods for identifying plant and animal species in food; Enzyme immunoassays for identifying animal species in food; Proteome and metabolome analysis for food authentication; Near infra-red absorption technology for analysing food composition; NMR spectroscopy in food authentication; Using stable isotope ration mass spectrometry (IRMS) in food authentication and traceability; Spectrophotometric techniques; Gas chromatography; High pressure liquid chromatograophy (HPLC) in food authentication; Enzymatic techniques for authenticating food components; In-line sensors for food analysis; Chemometrics in data analysis. Part 2 Authenticating and tracing particular foods: Species identification in processed seafoods; Meat and meat products; Milk and dairy products; Cereals; Herbs and spices; Identifying GMO's; Wine authenticity. Part 3 Traceability: Traceability in food processing: An introduction; Developing traceability systems across the supply chain; Developing and implementing an effective traceability and product recall system; Traceability in fish processing; Safety and traceability of animal feed; Geographical traceability of cheese; Advanced DNA-based detection techniques for genetically-modified food. The ability to trace and authenticate a food product is of major concern to the food industry. This important topic is reviewed extensively in this authoritative text on current and emerging techniques. Part one deals with analytical techniques applied to food authentication. There are chapters on both established and developing technologies, as well as discussions of chemometrics and data handling. Part two relates these methodologies to particular food and beverage products, such as meat, dairy products, cereals and wine. In part three traceability is reviewed in detail, looking at the development of efficient traceability systems and their application in practice to such areas as animal feed and fish processing. 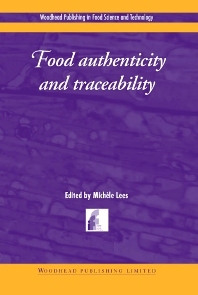 Food Authenticity and Traceability is an essential reference for all those concerned with food safety and quality. Dr Michele Lees is Director of Collaborative Research at Eurofins Scientific Laboratories, internationally known for its work on food analysis and authentication.